Turn your garage into a showroom with an Epoxy Garage Floor! Epoxy floors are designed to be chemical resistant, long-lasting, extremely durable for commercial shops. 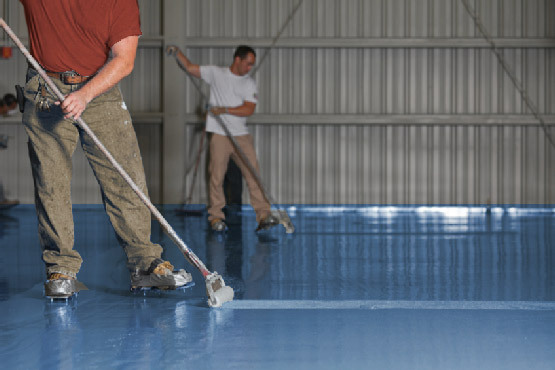 An epoxy garage floor is perfect for an airplane hangar because of its durability and chemical resistance. Ultimate Garage is a network of professionally trained contractors specializing in and offering a variety of coating systems to meet your specific needs including Epoxy garage floors. We have experience installing epoxy garage floors for both epoxy garage floors for residential and commercial applications. Because we use only industrial grade products requiring specialized equipment and training, our floors should never be confused with do-it-yourself kits. Our proprietary methods, combined with more than 30 years of specialty coatings experience, ensure professional results. In addition to floor coatings, we also offer garage cabinets, wall organization systems and overhead storage racks with installers serving the Pacific Northwest and Southern US: California, Oregon, Washington, Idaho & Texas. For pricing or to locate a contactor near you click on Local Installers. At Ultimate Garage, we understand the longevity of our company is dependent upon repeat business and referrals from highly satisfied clients. This can only be accomplished by providing you with the highest level of workmanship and attention to detail. Our goal isn't simply to meet your expectations, it's to exceed them. And our reputation proves it.